I love the way this show is made, it follows a group of new lawyers, split into prosecutors and defenders all based around the Southern District of New York (SDNY) Federal Court, known as “The Mother Court”. You get a sneak preview of their lives and how they are going to play out their cases. I find it really interesting. It reminds me of the first couple of episodes of Greys when you meet all the characters and how they link together. It’s a nice way of introducing us to everyone. Each episode is about the groups set of cases, sometimes they oppose each other which is interesting and then there are a few underlying stories which carry through to each episode. If you like case shows then this is definitely the one for you. Set in the United States District Court for the Southern District of New York (a.k.a. 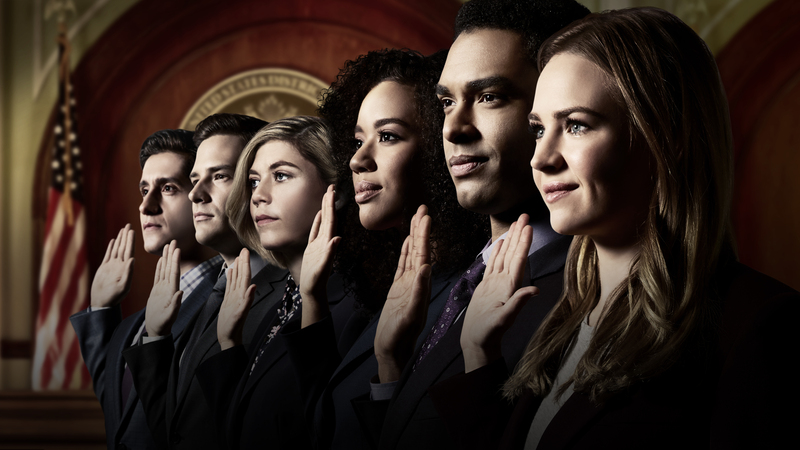 “The Mother Court”), the new Shondaland series show follows six talented young lawyers working on opposite sides of the law and handling the most high-profile and high-stakes federal cases in the country. I love this group of characters, they are so funny. My favourite at the moment has to be Kate Littlejohn, she is what I strive to be on a daily basis. She is organised, fully knowledgeable, on the ball and is always one step ahead. She is brilliant. She is also one of the prosecutors. Then there is Seth and Leonard, who are all sitting together in the photo below. They are all very good at their jobs – Seth is coming across like he is weaker lawyer at the moment and Leonard as a bit of a shark – but I am sure that will change. Then on the defendant side we have Sandra, Allison and Jay. It’s been fun watching them challenge the prosecutors and try to defend their clients. Sandra is my favourite on that side – she reminds me of me. Allison and Seth start off in a relationship together – can they keep it up though. Jay is really helpful to his colleagues and seems like a decent guy. On top of all of this there are other characters that are in each episode from the courts and the firms. I will let you find those out for yourself!